An Entity–relationship model (ER model) describes the structure of a database with the help of a diagram, which is known as Entity Relationship Diagram (ER Diagram). 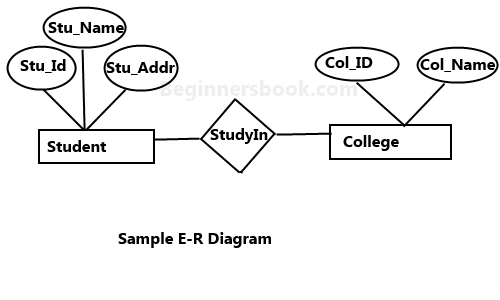 An ER model is a design or blueprint of a database that can later be implemented as a database. The main components of E-R model are: entity set and relationship set. What is an Entity Relationship Diagram (ER Diagram)? An ER diagram shows the relationship among entity sets. An entity set is a group of similar entities and these entities can have attributes. 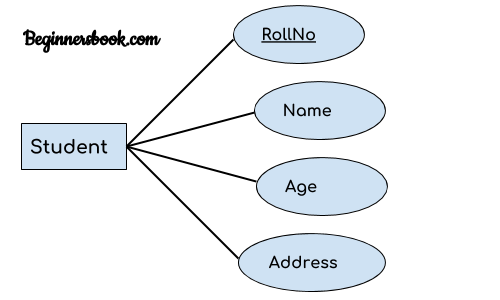 In terms of DBMS, an entity is a table or attribute of a table in database, so by showing relationship among tables and their attributes, ER diagram shows the complete logical structure of a database. Lets have a look at a simple ER diagram to understand this concept. In the following diagram we have two entities Student and College and their relationship. The relationship between Student and College is many to one as a college can have many students however a student cannot study in multiple colleges at the same time. 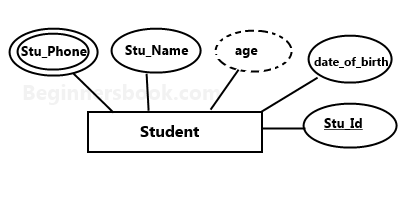 Student entity has attributes such as Stu_Id, Stu_Name & Stu_Addr and College entity has attributes such as Col_ID & Col_Name. Here are the geometric shapes and their meaning in an E-R Diagram. We will discuss these terms in detail in the next section(Components of a ER Diagram) of this guide so don’t worry too much about these terms now, just go through them once. An entity is an object or component of data. An entity is represented as rectangle in an ER diagram. 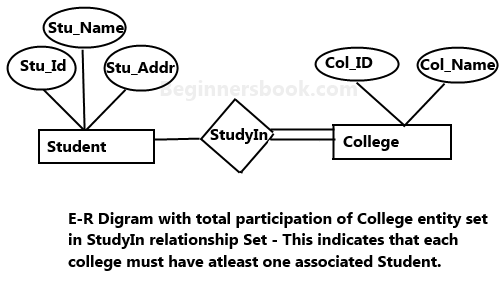 For example: In the following ER diagram we have two entities Student and College and these two entities have many to one relationship as many students study in a single college. We will read more about relationships later, for now focus on entities. An entity that cannot be uniquely identified by its own attributes and relies on the relationship with other entity is called weak entity. The weak entity is represented by a double rectangle. For example – a bank account cannot be uniquely identified without knowing the bank to which the account belongs, so bank account is a weak entity. A key attribute can uniquely identify an entity from an entity set. For example, student roll number can uniquely identify a student from a set of students. Key attribute is represented by oval same as other attributes however the text of key attribute is underlined. An attribute that is a combination of other attributes is known as composite attribute. 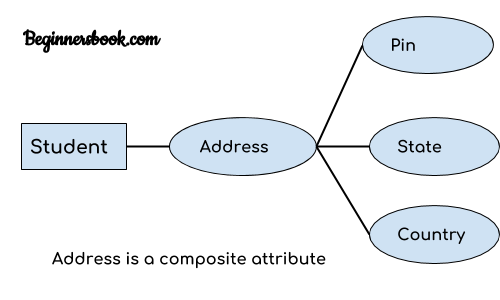 For example, In student entity, the student address is a composite attribute as an address is composed of other attributes such as pin code, state, country. An attribute that can hold multiple values is known as multivalued attribute. It is represented with double ovals in an ER Diagram. For example – A person can have more than one phone numbers so the phone number attribute is multivalued. A derived attribute is one whose value is dynamic and derived from another attribute. It is represented by dashed oval in an ER Diagram. For example – Person age is a derived attribute as it changes over time and can be derived from another attribute (Date of birth). When a single instance of an entity is associated with a single instance of another entity then it is called one to one relationship. For example, a person has only one passport and a passport is given to one person. When a single instance of an entity is associated with more than one instances of another entity then it is called one to many relationship. For example – a customer can place many orders but a order cannot be placed by many customers. When more than one instances of an entity is associated with a single instance of another entity then it is called many to one relationship. For example – many students can study in a single college but a student cannot study in many colleges at the same time. When more than one instances of an entity is associated with more than one instances of another entity then it is called many to many relationship. For example, a can be assigned to many projects and a project can be assigned to many students. A Total participation of an entity set represents that each entity in entity set must have at least one relationship in a relationship set. For example: In the below diagram each college must have at-least one associated Student. Thanks for this. Bcz this really very easiast way to describe this which is easily understood by anyone. Thank you so much sir. Understood everything really well. saved a lot of googling hassle.